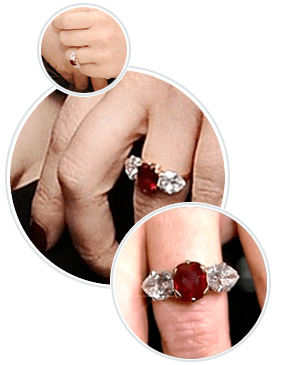 Jessica Simpson’s engagement ring is unusual, not just because the center stone is a ruby rather than a diamond, but because rubies of its size are extremely rare and difficult to find. The ring was designed by celebrity jeweler Neil Lane and was presented to Jessica by now-husband Eric Johnson back in 2010. Like Jessica Simpson’s engagement ring, this example from Brilliance combines diamonds with red rubies. The ring features a big diamond at its heart, two smaller diamonds on each side, and two splendid red rubies that complete the look. The gold setting complements the ruby’s color perfectly. This is a classic ring that will never go out of style. Resonating timeless elegance, it’s an heirloom piece that will be treasured for life. Born July 10th of 1980, Jessica Simpson is an American singer, songwriter, fashion designer, actress, and reality television personality who made her debut in 1999. Since then, she has made a number of recordings, starred in several commercials, TV shows, and movies, and launched her own fashion and fragrance lines. Simpson first rose to fame with the release of her single, “I Wanna Love You Forever,” which reached its peak at the top 5 of the Billboard Hot 100. Her debut album Sweet Kisses was certified double Platinum in the US, and sold more than four million copies worldwide. In 2001, her single “Irresistible” became a Top 20 hit and the album of the same name received Gold certification from the Recording Industry Association of America. Jessica’s third album, In This Skin, became her best-selling one, receiving a triple Platinum certification from RIAA and climbing all the way to number 3 on the Billboard 200. Subsequent albums including A Public Affair, Do You Know, Happy Christmas, and Playlist: The Very Best of Jessica Simpson have brought Simpson additional success and accolades. She has achieved three gold and two multi-platinum record and seven Billboard top 40 hits. Between 2003 and 2005, Jessica Simpson and former husband Nick Lachey starred in the MTV reality show Newlyweds: Nick and Jessica. After the couple split, Jessica went on to appear in a number of films including The Dukes of Hazzard and Private Valentine: Blonde & Dangerous. She has also appeared on several TV shows. Did you know that Jessica Simpson had an unsuccessful audition for the Mickey Mouse Club at age 12? That didn’t stop her from singing. She released a gospel album titled Jessica at age 14, and signed with Columbia Records at age 16. Jessica Simpson and retired NFL tight end Eric Johnson started dating in May, 2010, and were engaged that November. The couple were married July 5, 2014, and have two children together. What Our Experts Have to Say about Jessica Simpson’s Engagement Ring. Jessica Simpson’s engagement ring features a central ruby that weighs in at about five carats. A pair of diamonds, each of which comes in at over two carats, flanks the massive ruby. Designed by celebrity jeweler Neil Lane, it offers a well-balanced look and is a unique departure from the typical all-diamond engagement ring. Jessica’s ring is set in yellow gold but would look equally amazing in white gold, platinum, or palladium. The original is worth an estimated $100,000. Celebrity engagement rings like the one Jessica Simpson received from Eric Johnson cost a fortune, but that doesn’t mean you can’t enjoy a similar look while sticking to your budget. Whether you are looking for a replica of Jessica Simpson’s ruby engagement ring or want something a little different that gives a nod to her classic sense of style while incorporating elements that are meaningful to you, you’ll find that Brilliance has the ability to make your engagement ring dreams come true. Try our custom design tool for yourself and add sparkle, color, or a little of both to your life.